I've been fussing with the auxiliary tape on my 95 RMW since buying the car. I've never been able to get it to play, it just flips between the two sides. I tried pulling some of the parts out of the tape itself, but haven't had any luck. Looking through my owner's manual it states that an auxiliary "CD" (or I guess tape) player will not work with the radio. I've tried with two different aux tapes. Is it possible to use an aux tape? I've read some posts stating that unlocking the radio might make it possible, but my radio isn't locked... It works and I can use it. I really don't want to use a wireless FM radio transmitter because the quality is usually pretty poor and I just love the style of the OEM 95 radio, so I don't want to replace it. Are you trying to play cassette tapes? 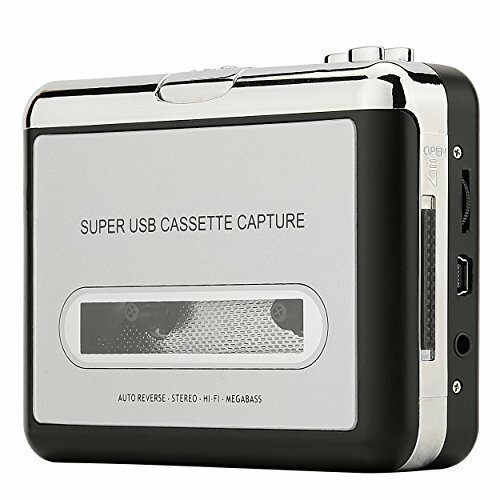 If so, buy the unit below for $22 and convert your cassette tapes to MP3 while they still have a signal left on them. If you don't convert them before they crap out and break, they'll be lost. Once converted to digital, you'll have lot more options to play them through the OEM radio. Seconded. I have this same tape converter and the sound reproduction from it is surprisingly good. I'm actually trying to get my current cassette player to play my auxiliary cassette tape. It's the type of cassette with a aux cable coming out. The cassette player keeps auto flipping it and then it spits it out. I've tried taking apart the cassette to remove or clean the parts that may cause the auto-flip, but with no luck. The owners manual states that auxiliary players won't work with the OEM radios, so I'm wondering if there's a way to bypass the system. I read that with some AC Delco radios you can hold the "cassette tape" button for 3-5 seconds it will fix the problem. In that case, a permanent but somewhat more expensive solution might be the services that install an aux input on your OEM radio ($115 on eBay last time I checked), or the deluxe radio/cd/cassette AC/Delco unit with an aux plug installed on the faceplate for $185, also on eBay. I'm assuming you've already tried the 3-5 second hold trick and it didn't work. If there is a desire to actually play cassettes, there are DIY fixes for the side-flipping syndrome on the internet. Has to do with the optical end-of-tape sensor. Extremely common problem on Delco players. Playing +20-yr-old audio cassettes in your car stereo might be fun, but they will likely break or lose their signal in the process; if not immediately then eventually. Conversion to digital files before this happens is prudent and cheap unless you want to buy digital music from iTunes as one-offs. Rev Bob, that helps because I haven't been able to specifically research the part that has been causing the auto-flip, because I haven't been able to identify the part that triggers it. "I tried one of these in the factory radio in a Cadillac Cimarron. It used optical end of tape sensing to reverse direction. Without any way to block the sensors the deck would just rapidly change directions, thus I couldn't use one of these adapters. Probably could have figured out where to glue in a piece of plastic to block the sensor but it was easier to replace the radio with a CD player. Bizzybody (talk) 07:06, 2 January 2014 (UTC)"
It also depends on the cassette you use. I have the same problem with my Buick Century. I went through a few different ones, and the only one I found that worked reliably came from Advance Auto and was the "MotorTrend" brand. Other posts i've read on the subject recommend you take apart the cassette and remove the reverse gears. I've done that too. I took out the reverse gears and it didn't work. I tried removing different combinations of gears as well as an entirely new aux cassette and nothing worked. Here's a link to one of the companies that provides the mod service for your factory radio to install an aux port. It's $165, but they guarantee their work, and you get to keep your original radio. Its been a great addition and looks factory and included a rebuilt tape deck and replaced lighting. I highly recommend him as well! I bought a radio from him for the wife's now departed '89 Suburban and it looked fantastic but the AUX port didn't function properly. I contacted him and sent it back, he fixed it and had it back to me in a couple days and refunded the shipping cost as well! For the few years it was in the truck it worked and sounded perfect! Onb my 95 I went with a complete new head unit that most all the modern options (no CD or tape tho) but has 2 usb one line in plus an SD slot for multimedia. For nav it has GPS and android auto or apple car play. I have the AM/FM/CD/Tape unit in my 95 and it works properly, but it doesn't like the "aux tape" type things that we used back in the day to plug a discman into a car tape deck. It'll play for a couple of seconds and then spit it out displaying Err. I did pull another one of the same deck from a junkyard a while ago for experimentation and possible Aux-in modding which I may get to one of these days.